Guinea pigs are one of the most curious and active pets over others. That’s why they make great companions without any doubt. To be a great guinea pig owner, you have to understand and know how your pet is feeling all day and night. Sadly, your little one can speak to you, and that’s why it is vital to understand your pet through noises and sounds he makes. Pet guinea pigs make different sounds, and if you are wondering about your pet chirping sound, then you have come to the right page. Here, you will get to know why guinea pigs chirp or what they are saying when they make chirping sound. As guinea pigs are a quiet creature and that’s why they make sounds and noises often to show their feelings to their owners. Understanding your pet sounds is the key to build a strong and closer relationship with your pet. If your guinea pig makes a lot of sound like chirping and you are not getting what your pet is trying to tell you then continue reading this post to know about it. What Do Other Noises Guinea Pigs make? What are the Signs of Happiness and Stress in Guinea Pigs? Chirping sound that your guinea pig makes is just like a bird chirping. Unfortunately, it is only the noise of guinea pigs that is hard to understand what they want to express through this noise. Moreover, this sound of guinea pigs is quite rare. It generally occurs when your pet is in a trance-like state. This strange sound is not entirely understood yet. However, it is more often comes from guinea pigs that have lost their partner lately. So, if your guinea pig had recently someone with whom he had a strong bond, then you may hear this sound coming from your pet. Thus, the chirping sound of guinea pigs related to discomfort or stress. Or another reason when you hear this sound from your pet if your little one is hungry. Once the sound end, your pet may resume doing whatever he was doing as nothing happened. And the chirping sound of guinea pigs will last for few minutes only. Whenever you hear chirping sound from your pet, try to comfort your pet as maybe your pet is sad and your comfort can give some peace to him. 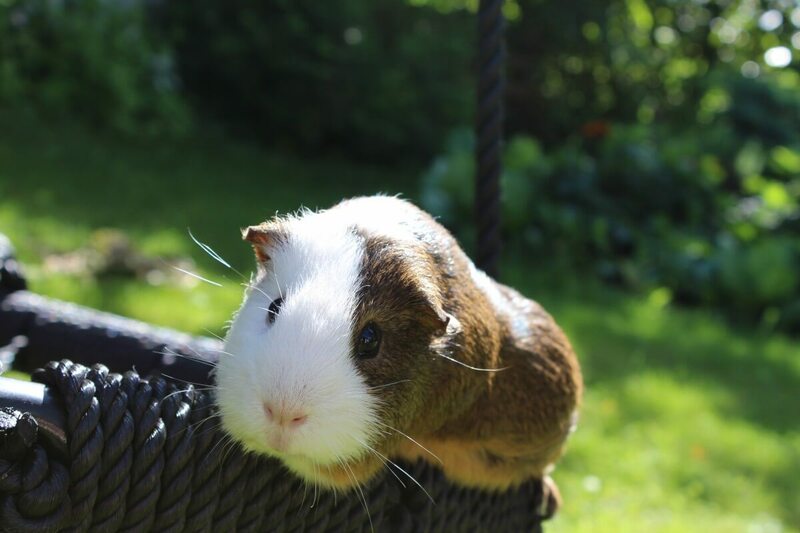 As it is very rare guinea pigs chirp and there are many other sounds you need to know so that you can understand what your pet wants to tell you. So, let’s explore other sounds that guinea pigs make and what they are trying to tell you with these sounds. Guinea pigs generally make high pitched whistle and squeal. This whistling noise of guinea pigs shows that they are happy and excited about playtime or feeding time. So, if your guinea pig makes this sound, then it means he is excited about something. Another sound of guinea pig is the purr, and this makes your pet like a cat. This sound comes with different meanings. A relaxed and deep purring sound means your pet is happy or content and on the other hand, a higher pitched purring sound is more probably annoyance sound. And an apprehensive purr means your pet is afraid of something. The hissing sound or also known as chattering teeth and it means your pet is aggressive and angry. So, if you see your guinea pig making a hissing sound, then it means he is aggressive about something. Maybe you have done something, your pet does not like at all. Some guinea pigs will squeal when they are having pain, or they seek attention. So, pay close attention to your pet if you hear this sound coming from your pet as it indicates that your pet may need some kind of help from you. This sound is similar to the purring sound, but it comes with a lower pitch and vibrating effect. The sound generally comes from male guinea pigs when they are wooing the female ones to mate. Or when the male guinea pig is not making any efforts to romance the female one, the female one may make rumble sound to give a sign to the male guinea pigs that she is ready for mating. If your guinea pig is happy with you, he will express this feeling through his body language. When genuine pigs are happy, they do hopping up and down, just like popcorn popping. Another sign of happiness is rubbing noses; they run noses of each other. And licking is also a sign of happiness and friendliness. How to know if your guinea pig is depressed or sad? If your pet is sad, then it will reflect on his behavior. Generally, a depressed guinea pig’s show signs of aggressive nature and irritability. That’s all on all common sounds and noises that guinea pigs make. Sometimes, they also express their feelings through non-verbal communication. If you are able to recognize your pet behavior, then it will surely help you to understand more about your pet. As we told earlier, guinea pigs chirp very rarely, and if they do, then it indicates they are sad, or they are in some kind of distress or stress. If you are not able to identify what your pet is saying, then the best thing you can do is contacting your vet. Are Guinea Pig Good Pets? Do Guinea Pigs Need Shots?